focusing manually through the viewfinder was a little hit and miss. As with most DSLRs, I found myself using the focus confirmation in the viewfinder to confirm I had manually focused correctly. This somewhat defeats the purpose of manually focusing in the first place, as relying on the confirmation produces the same result as the AF. 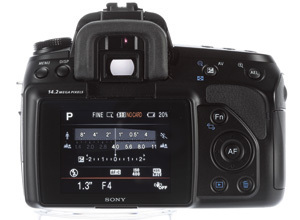 One of the major compromises made in the Alpha 450 is the LCD screen. The 3in tilting screen currently fitted to the Alpha 550 has gone, only to be replaced with a somewhat lacklustre 230,400-dot, 2.7in screen. It is the same LCD screen as that fitted to the Alpha 380, 330 and 230 cameras, which are lower down the range thus reinforcing the Alpha 450’s position as above these three models but below the Alpha 500 and 550. As I mentioned earlier, Sony’s unique Quick AF Live View system isn’t featured in the Alpha 450, which is another major difference between this camera and the Alpha 550. The Quick AF system uses a secondary sensor in the viewfinder to produce the Live View image, which means that uninterrupted phase-detection autofocus can be used when shooting in this mode. Live View is still present in the Alpha 450, but contrast-detection AF is not. This means that Live View must be interrupted while the usual phase-detection focusing takes place, before the Live View image returns to the screen. A further annoyance is that, having released the shutter and captured an image, the Live View does not automatically restart. With its somewhat restrictive nature, Sony has named the feature Manual Focus Check Live View, with the obvious intention of it being used solely for the purpose of checking manual focusing. When used in this manner it performs well, with 1x, 7x and 14x magnification views to allow the focus to be checked at particular points in an image. I rarely use Live View modes, and when I do it is usually only to check that I have manually focused correctly. The only exception to this is when I am using a Sony DSLR that features the Quick AF Live View. Taking this into consideration, it is a shame that the superior Live View system has been sacrificed to bring the camera in at a lower price point, although I found the omission to have little overall effect on how I would use the camera.